Enable professional athletes to fundraise for their charity of choice with minimal effort, while being part of a ground-breaking retail wine product that can also be shared at personal events. Charity Hop took our Charity Wines client novel idea and made it reality. We developed the roadmap to obtaining athlete participants, managing the branding process, organizing charitable partners, aligning with key league and media partners, and executing the regional launch events. 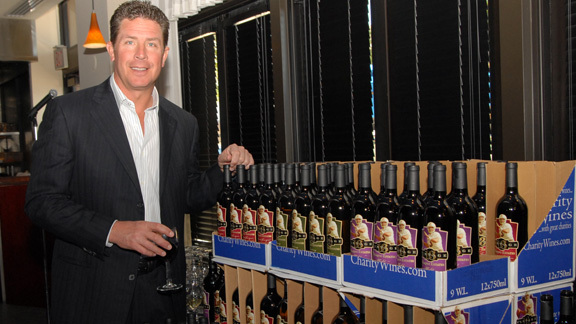 Charity Hop became well known for launching “Charity Wines” for dozens of professional athletes. This venture netted tremendous local and national exposure for both the charitable organization and athlete supporting it – not to mention in excess of $1 million charitable dollars raised. Clients ranged from Red Sox slugger David Ortiz to NFL Hall of Famer Dan Marino. Charity Hop was able to deliver tens of thousands of charitable dollars each to dozens of worthy organizations, while boosting our athlete’s profiles in their local communities through targeted media campaigns, donated advertising, and successful launch events. Charity Wines were featured in countless national media outlets headlined by a full page spread in Sports Illustrated, a segment on ABC World News, feature story in Fortune, and story in GQ. Charity Hop was honored with two gold awards by the New England Direct Marketing Association for their work on the Charity Wines campaign, and the wines for MLB legends Brooks Robinson, Ernie Banks, Mike Schmidt and Eddie Murray were entered into the National Baseball Hall of Fame and Museum. Learn about each baseball wine that was released on Baseball Life. Or enjoy this video on the success Charity Wines have had over the years.